I started some Black seeded Simpson in containers two weeks ago. Now that there sprouted I was wondering if it would be ok to put them in the ground. I live in southeast Louisiana and we are having a fairly mild winter being that it only gets cold (45 Degrees) a few days at a time with an occasional 34 Deg.over night. If not, what other things can I grow now? I have Garlic in the ground and it seems to be doing well. just looking for a little advice if anyone is willing to share. Swiss chart broccoli and cabbage will grow well in those temps! Even potatoes!Try some oak leaf lettuce! They should be fine. Go ahead and plant them! I had a whole bunch in till a few days ago when I pulled them because they were really big! Delish! Absolutely lettuce now in your climate. It is frost tolerant and cold hardy, but tends to bolt as soon as the weather warms. Bobber mentioned swiss chard which is my favorite thing to grow ... it is also frost tolerant and cold hardy, but unlike the lettuce and spinach (another thing you could plant now), it stands up to heat and keeps going all season. southernslang wrote: I started some Black seeded Simpson in containers two weeks ago. Now that there sprouted I was wondering if it would be ok to put them in the ground. I live in southeast Louisiana and we are having a fairly mild winter being that it only gets cold (45 Degrees) a few days at a time with an occasional 34 Deg.over night. If not, what other things can I grow now? I have Garlic in the ground and it seems to be doing well. just looking for a little advice if anyone is willing to share. I live in N.O. and have Kale, Swiss Chard, Collard Greens, Broccoli, Beets, Garlic, Onions, Radicchio, and several varieties of leaf lettuce. I also have peppers and Tomatoes(started in Sept.--- too cold now to put them in. You can start those in cells now for transplanting in early March if you have the room. Just make sure they stay evenly heated, well watered when needed and get lots of light. You may want to start these indoors since Feb. us usually a strange weather month for us. We never know if it is going to be short sleeve or heavy coat weather for Mardi Gras. Ill put them in the ground tomorrow, ill also be planting some other things. I have some Great lakes head lettuce, cabbage, a hybrid spinach, turnip, mustard, and collards. Ill post pics as I go along. Thanks for the advice. Onions are a good cool weather crop. Spinach, peas, mustards, cabbage and all in that family will do well too. Yes on your lettuce and any other greens - love spinach and mustards. Root crops - turnips carrots and beats. You can try cabbage, broccoli and cauliflower but it may be a little late. Best planted in the fall. If it does not get too hot too soon you can still get some production. I planted cabbage, broccoli and cauliflower this time last year from transplants. They did not get as big as they would have if I had planted in the fall but I did get a nice crop. I have to get back with you - I tried a new variety of turnip last year that was wonderful! Snow white and never got bitter. I forgot I will look it up and get back to you. Got it - Tokyo. Excellent production and a lovely flavor. This is a great link for Louisiana gardeners. have to wait till after all this rain is gone before i put them in the ground but here they are. any advise on the processes of transplanting them with the least casualties ? I tried useing a a small spoon and the it was catastrophic. The roots are already starting to tangle in to one anther.just last week the roots were barley in the dirt. Black seeded Simpson will make a nice full head if you thin it and give it room to grow. I guess some will have to die for the greater good. "any advise on the processes of transplanting them with the least casualties ?" 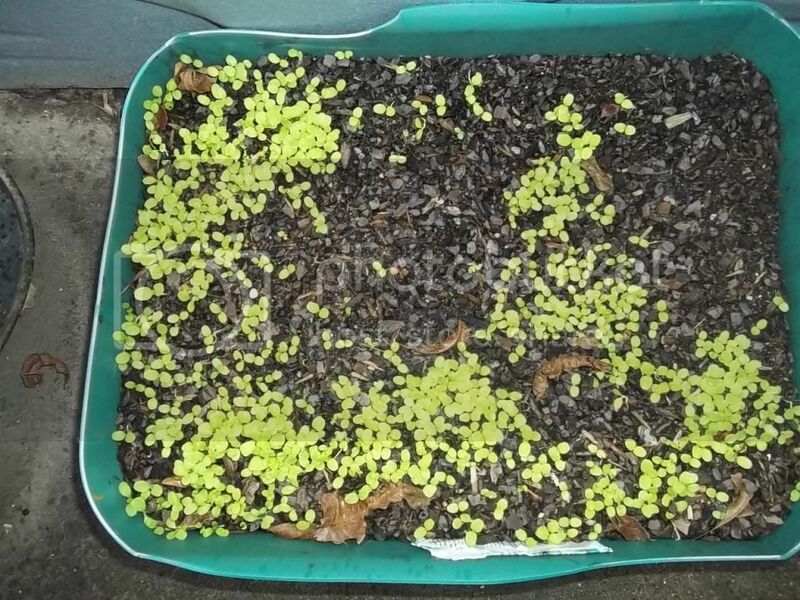 Wow, that is a lot of little seedlings in a small space. My guess is that they will likely end up bareroot trying to separate them. They may grow even at that if you plant them and keep them watered well for a couple of days. I plant my lettuce directly where it will grow, but I put 3 or 4 seeds in a bunch every foot in the row. Later I thin the bunches to one plant. Now it has room to make a nice head. I sometimes transplant the ones I pull when thinning and they usually grow, though they will wilt down when first planted. 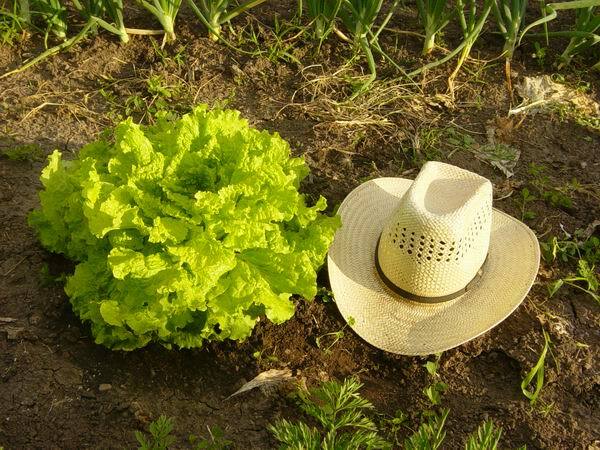 Leaf lettuce can be eaten at any size. I like to grow some nice big heads for market. If you are going to eat it fairly small, you could probably take a spoon and cut out 4 to 5 in a bunch and plant them together. Later eat the small leaves or cut out all but one and eat the thinnings. Best to cut them off when thinning rather than pull, as pulling may damage the roots of the one left. Have a great crop! Ill spoon them in small groups, and just thin them once established, Ill just have to explain to them its not because i love them less then the others. the sacrifice must be made. Yeah, that is a ton of tiny little seedlings! Ordinarily I would not try transplanting seedlings that small. I prefer to wait until they have a couple pair of true leaves and a better root system. I think they survive transplant shock better that way. However, yours might not survive until then, they will be crowding each other out so much, so I think you need to proceed. Scoop a spoonful out together and then use a toothpick to pry them apart and a tweezers to handle them for replanting. It takes a little practice handling the tiny seed like lettuce, not to overplant so much.